We help address the issues members in the industrial SSD storage community have experienced in the past and are currently experiencing. Working in the field of SSD storage for over 18 years we are confident we can assist you with your storage issues. With our proven track record, we encourage you to post any questions or comments you have and our experts will lend their years of knowledge to answering your questions. Industrial PCMCIA PC Cards, High Temperature, Industrial Grade, Shock and Vibration Tested. Available from 16MB to 16GB. Industrial Compact Flash Cards, Industrial Grade, Shock and Vibration Tested. Available from 16MB to 64GB. Industrial SLC SD Cards. Temperature rated from -25C to +85C Available from 128MB to 4GB. PCcardsDirect's USB 2.0 Industrial rated temperature rated flash drive. -40 to +85 degrees Celsius. Ranging from 16MB to 4GB. As many traditional suppliers are transitioning to MLC flash from SLC flash memory how can you be sure you are getting industrial grade flash memory products? Though MLC flash memory may be more cost effective to you it is not more reliable that SLC manufactured memory. SLC flash memory includes advanced wear leveling algorithms for better durability and longevity. Industrial flash cards are temperature rated at -40C to +85C operating temperature. Additional specifications include shock ratings of 1500G and vibration tested to 20G. Companies looking to replace older flash memory such as Sandisk, Kingston or SiliconSystems, will need to consider the proper level of support in addition to the correct flash hardware component. Older cards having used the latest chips and BIOS of their time will be difficult to replace. Transitioning to a newer chipset with a new BIOS capable of addressing larger capacities will allow for the transition of legacy hardware to available flash products on the market today. The search engines will return a plethora of potential hardware suppliers. However you must consider the post support available after you have purchased. Pre & Post support are critical to a smooth transition of hardware components. One such partner to consider is www.SSDsDirect.com…. Armed with a new interactive website, product reviews, comments and questions related to SLC flash memory offers you the level of support you need to determine the right amount of support needed to complete you project in a successful and timely manner. Ask your supplier is they offer samples and offer post technical support on the product as it relates to your installation. With you over 15 years of flash memory experience www.PCcardsDirect.com… and its affiliates offers a high level of support no available to most online e-Tail, retail and VAR. Contact sales at PCcardsDirect.com… for additional information regarding this article. Sandisk 8MB PCMCIA card are they still available? Are you looking for old Sandisk PCMCIA cards? This can be one of the most frustrating jobs. As a manufacturer of industrial flash we still receive requests for the old Sandisk SDP3BI cards. These PCMCIA cards offer by Sandisk in the late 90s and early 2000 was a very popular standard for software engineers to base their designs around. The Sandisk 8MB PCMCIA card was one of the first cards used in industrial systems. Legacy equipment today still requires this card due to the unique controller used in production. Due to the high cost of reprogramming and tooling involved to adapt this equipment to the new BIOS in modern PCMCIA cards, older Sandisk PCMCIA cards are the only option. Many integrators and system builders have come across this same situation where only a very specific hardware product is compliant with the host system. For this reason specific legacy memory cards such as the Sandisk PCMCIA cards still are in demand in the market today. You may visit www.pccardsdirect.com… for a list of available cards. Industrial grade, industrial temperature, shock and vibration tested 2GB PCMCIA cards available for military aircraft. Using a custom chip configuration these cards are designed to operate in harsh environmental conditions. Quick Access Recorder has accepted the PCcardsDirect 512MB industrial flash card part number #PCDATA512MBI. Please contact sales@PCcardsDirect.com… for additional information. Higher capacities also available. Alice 4 polysomnograph has accepted the 512MB industrial flash PCMCIA card part number #PCDATA512MBI. 1. Western Digital purchased SiliconSystems. 2. 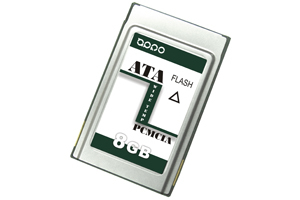 After the acquisition Western Digital discontinued production of the PCMCIA ATA Cards. They still continue to offer compact flash cards…For now..
3. The old “-3012” series SiliconSystems cards are no longer available. The new series is the 4000 series. Typically a 6-8 week lead time when purchased in quantities of 60 or more. 4. Why off the shelf cards are not compatible as drop in replacements? SiliconSystems used a proprietary combination of flash and controller to assemble their cards and drives. Many solution providers ensured that their hardware required only SiliconSystems cards to operate. 5. Are any of their options such as SiPurge, SiDestroy still available? There other drives on the market that offer these features. However, they are very expensive and typically cost prohibitive to anyone except the military. 6. Can I make any changes to adapt to these new cards? Yes, typically it was the software that was configured to look for certain sectors on the SiliconSystems card. If you have access to the code you can change it to write to any sector of a card. 7. As the market for flash memory decreases the cost associated to develop, manufacture and promote these products continue to increase. In a shrinking market it is difficult for companies to spend millions of dollars and operate in the black. As a result we will continue to see legacy products disappear from the marketplace. What options are available to continue to service and maintain legacy hardware still in operation today? In the past five years we have had PCMCIA cards make a resurgence. Specially industrial grade high temperature rated PCMCIA cards. Older voice PBX systems, routers and large scale locomotives all still require this form factor. In all of these sectors it is not cost effective to upgrade the hardware to accommodate a card with a modern chip configuration. SiliconSystems Cards are they still available? Sandisk the leading producer of flash memory also lends a hand to the textile industry. Many large textile machines have used the Sandisk SDP3BI-16-201-80, 16MB PCMCIA PC Card as storage on industrial textile machines. Large textile producers in Italy have long used these cards to store and transfer data to and from their equipment. These industrial rated industrial temperature cards proved to be exceptional work horses. However, these 16MB 16bit PCMCIA cards are no longer available. Sandisk discontinued production of these cards some seven years ago, in shift to move in to the retail consumer market. Sandisk changed their focus from industrial products to retail consumer products. As can be seen in your local Costco with the pallets and pallets of USB drives offered in bulk. As production shifted to consumer goods industrial users of these cards where left with a hole in their supply chain. As today’s new laptops no longer offers a PCMCIA slot, so too has the PCMCIA cards fallen out of favor with manufactures such as SiliconSystems, Western Digital, and Kingston. 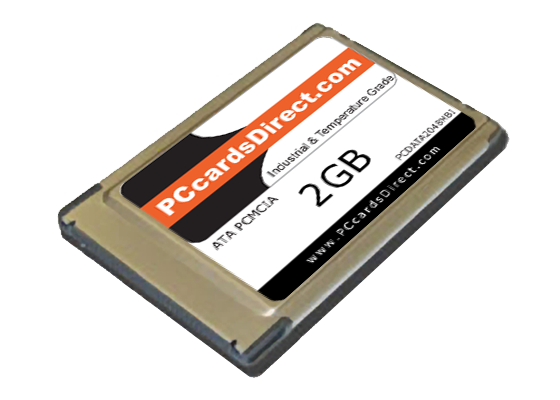 If you are looking to support aircraft, industrial equipment too expensive to upgrade to more traditional SD or Compact Flash cards, consider evaluating the PCMCIA ATA PC Card by PCcardsDirect. 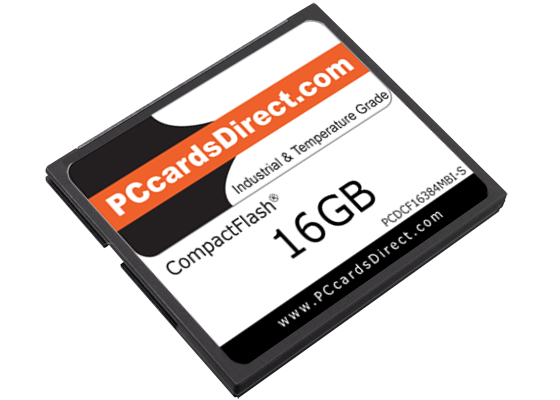 Offering capacities starting at 16MB, PCDATA16MBI, this cards is industrial shock, vibration rated and temperature tested to -40C to +85C. View the complete offering of Industrial PCMCIA Cards at …. Recent use of the APRO WRAFC001G-SDISI-UR, 1GB PCMCIA Card has proven compatible on the aircraft.